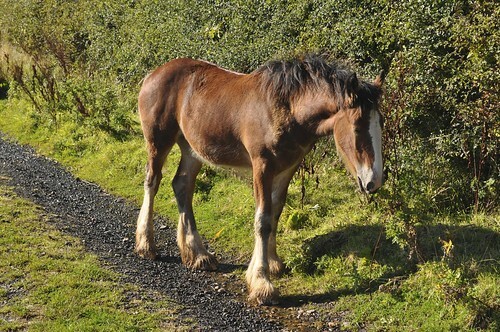 good to hear of another Shire horse in Scotland, I think they are fairly rare here. 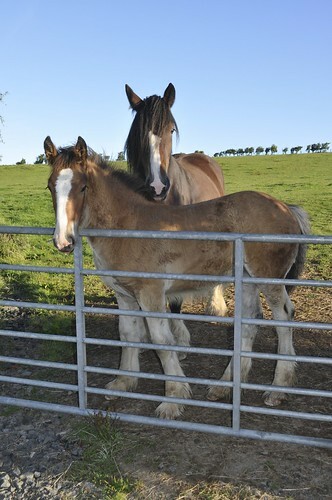 Haven't been on the site for a while so will update on my Shire mare and her X Clydesdale foal - Meggi - here are some pics, she's doing well and growing fast, one pic of autumn size, the rest recent. We have started weaning her this week - will start new post on that. Winter has been good to us so far on the SW coast of Scotland, sunny days and frosty ground, nothing like the North - no mud for weeks on end. This recent thaw has put an end to that now - back to typical coastal weather. Hi johnsculp,we're about as far north as you can go without getting your feet wet and we've had between 2 and 3 ft of snow with much deeper drifts but like you its just gone and now everything looks so dull after the beautiful clean snow. 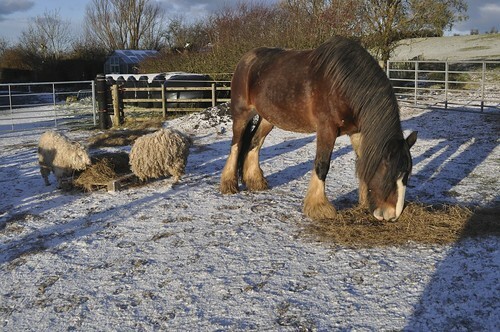 Lovely pictures,nice to be seeing more Shires up here. whats your gypsy mare in foal too? thats very exciting, we've had a few gypsy cobs ourselves. 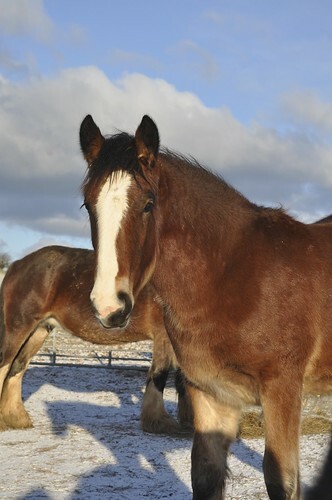 we cannot breed from our old clydesdale shes become infertile even though shes bred 5 colts in the past. we tried for 2 years but she just doesnt hold a foal so unless we buy another mare next year our shire opal will give us our 1st baby when shes old enough to put in foal. Stormdancerlady, your mare sounds great and at a nice age too, cant wait for those pic, the wait must be horrible. Is she coming from a fair distance? johnsulp great pic, and so lucky on the weather side. my field is now a mud bath, had to section half of today to rest it. Forgot to say a huge welcome!! 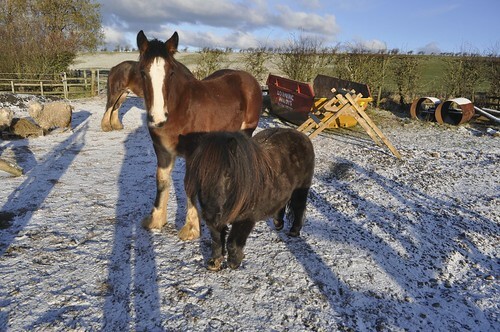 i am think of moving the ponies of it soon and leaving it for winter for when the big girl comes home over winter. I have asked the yard i want her at home over winter as was snowed in etc.. and their lack of wonter grazing. but then its finding a shetland proof field, lol. i have two fences keeping these ones in!! i havent heard of him is he also a gypsy cob? theres a rare silver dappled gypsy cob stallion called abs near us, coates gypsy cobs have bought some of his foals that have been born the same colour as him and i know that they paid a LOT of money for them. i have been tempted to buy a little gypsy mare to put to abs but we just love our huge heavy horses so we would rather buy another clyde or shire if we get more. kay they love sliding down hills dont they and all those scar marks just grow weeds instead of grass when they grow back. my friend has a hill field and she has to stable them whenever its wet or they just trash it, but she has a sand school so can let them out on the school. weeds!!! please dont scare me... i have huge bold spots , but on the up there is still some grassy bits. forgot to say that cob sounds NICE!. hi stormdancerlady,(long name and im only a one finger typist),i know your mare isadora,shes a good mare and very well bred,her mum hannah is an edingale mascot granddaughter(sire of galway warrior).i bought a 2 year old filly out of hannah recently just to get the bloodline.if you wanted to breed from her i know of a couple of stallions north of the border who may suit.i hope she is lucky for you. hi how do u up load a pic on here ? Hi stormdancerady, welcome to the forum. John those horses are lovely, mm pity about the thaw tho, yes our boys are minging now ! "if you wanted to breed from her i know of a couple of stallions north of the border who may suit.i hope she is lucky for you." Shire horse stallions in Scotland ? Can you let me know where please Ted. hi john,if you are in ayrshire, your nearest is probably glenys dodds in cumbria(father of B P opal),in scotland,theres one at berwick and one in aberdeenshire. your bay mare in the photo-whats her breeding? yes u should bring her to glens! my mare Mira is formally called Martonian Mirabilis, born 06/05/2000, a Mr. W E Waind of Marton Roham, Bridlington, Yorkshire was the breeder. Her sire was Scotlan Prince and her dam was Caerberllan Rosette 144525. Scotlan Prince died some while ago I believe. This year I would like to ride her starting after Meggi her foal is weaned, but perhaps next year I may consider trying to get her in foal. Would like to cover her with a traditional bay stallion if possible. Storm - it took me a while to work this out - there was no explanation on the forum when I joined. What I do to post pics - but there maybe other much simpler ways - this works for me though. First choose pic then upload it to a 'photo holding' website. I host my pictures on my Flikr Yahoo site. Then I go to the photostream on my Flikr site and click on photo I want to post on this forum. This opens up a new Flikr window with the picture in a single picture view surrounded by Flikr site stuff. If I right click on the picture it gives me options to open the picture in different pixel sizes (this one below is Medium 500). So open the pic up as a medium size. If I then right click on this picture again but this time open up it in a new window all I have is the picture itself, no Flikr text, headers, adverts, guff, etc. just a webpage with a single photo on its own.